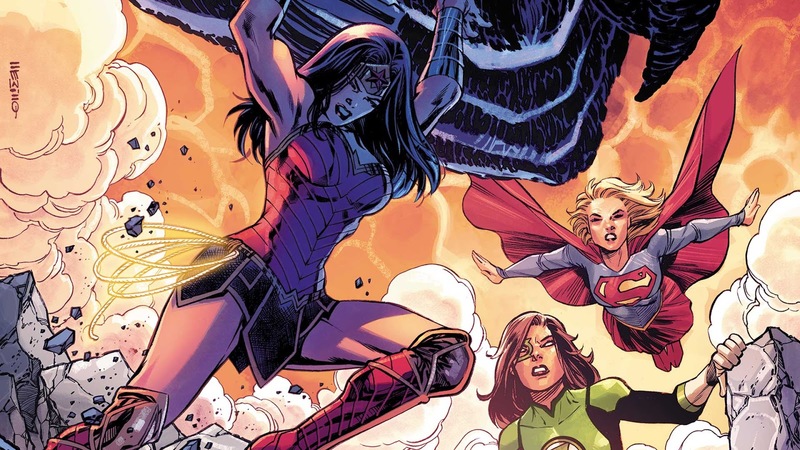 Well we had ourselves a bit of an exposition dump in last week's Wonder Woman Annual, where we learned all about why the Dark Gods are here and which ones they are. 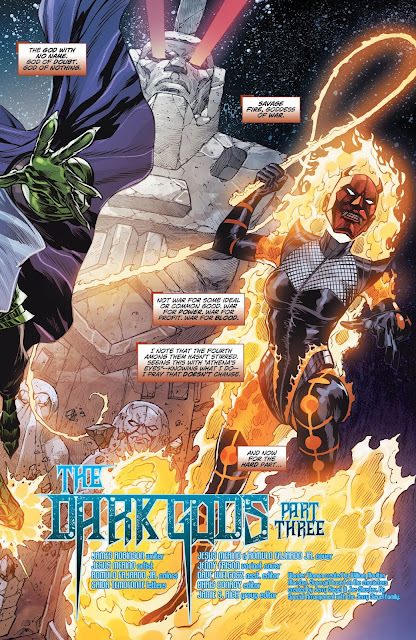 So with that, let's hope that we can just get right into this story and have something pretty epic told to us........ Also, that Wonder Woman is able to return from Zamoran in time to save the world before the Dark Pantheon goes and makes it just like their world in the Dark Multiverse. Let's jump into this Jason-centric issue and see if the brother of Wonder Woman is able to hold his own when his sister is away. Let's check it out. 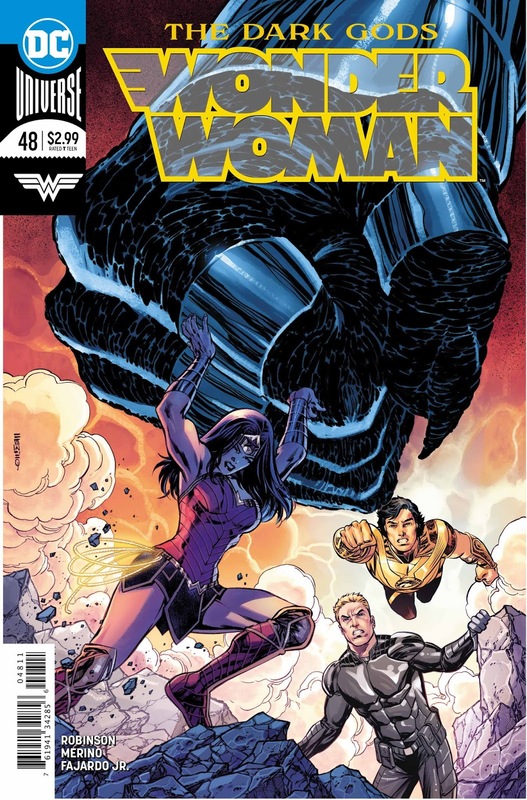 For this issue of Wonder Woman, we pretty much have forced ways of getting things the way they need to be for this story to work and for us and the heroes to learn what they need to know. 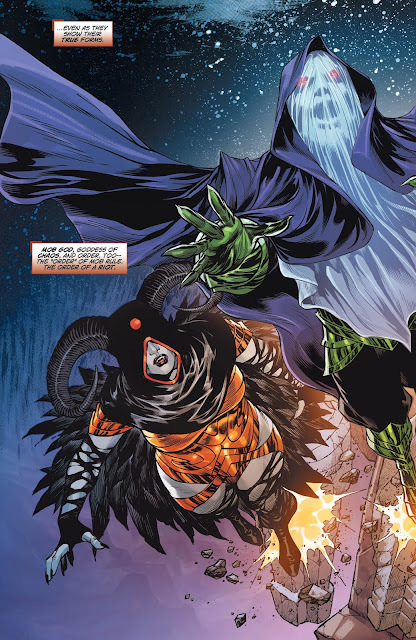 Like, Jason's armor has the ability to call upon a power of a god at any given time, but he's only able to use one at a time and for this issue he calls upon the wisdom of Athena so that he can immediately get the skinny on who these Dark Gods are and while I don't want to get bogged down with more of the backstory to the Dark Gods, this whole issue for how it has to conveniently get all the answers out there............ feels way off in both story progression and pacing. It's all hands on deck though for this Dark Gods threat that include Mob God, The God With No Name and Savage Fire, who are going all around the world and killing and or possessing people and because of such a threat we get some really big characters entering this book.......... who have nothing to do at all and who get out of this book pretty quickly. All in all, the art is pretty decent in this issue, but not a lot goes on here besides for throwing names and faces at the reader that I guess are suppose to impress, but by the end of the issue you realize that nothing really went down here and that we were just waiting for our title character to show up to continue the story. While I was initially interested in this Dark Gods story, I have to say that my interest is waning with each issue and this one has got to be the worst one yet. Yeah, the art is good, but the story just feels off in both progression and pacing and by the end you realize that the only reason that this issue exists is to throw the Dark Gods names at you and that's about it.